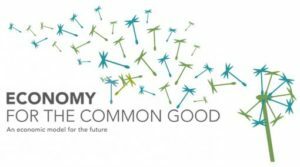 Economy for the Common Good is a social movement advocating for an alternative economic model. It calls for working towards the common good and cooperation instead of profit-orientation and competition which lead to greed and uncontrolled growth. Christian Felber coined the term in his book Die Gemeinwohl-Ökonomie – Das Wirtschaftsmodell der Zukunft, published in 2010. According to Felber, it makes much more sense for companies to create a so-called “common good balance sheet” than a financial balance sheet. The common good balance sheet shows the extent to which a company abides by values like human dignity, solidarity and economic sustainability.